Becoming an overnight sensation is no small feat—especially in the unpredictable world of jazz, and particularly in its very birthplace, New Orleans. But here, for your consideration, is Chloe Feoranzo, Exhibit A—small feet and all. 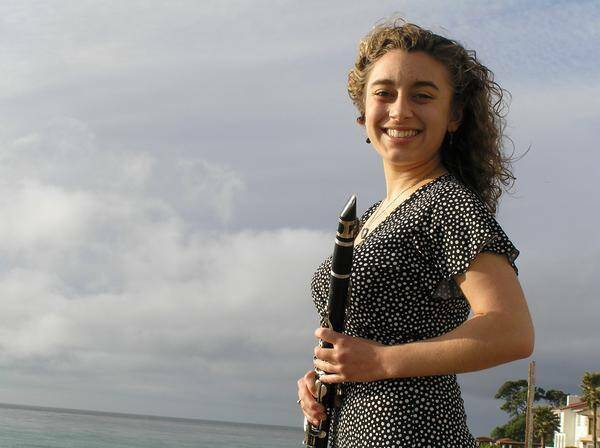 Learning her craft along a steady trajectory from San Diego to Los Angeles, then to St. Louis and down to the mouth of the Mississippi, the diminutive clarinet and saxophone player has already dazzled musicians in her own age group as well as the grizzled veterans—and she’s only 25. A visitor to The Big easy shouldn’t have a hard time finding this remarkable young talent—though she stands merely four feet, ten inches tall. Chloe was raised in San Diego, CA, and earned numerous honors as a musician in junior high and high school. She and her mother then moved to Los Angeles, where the late Pete Kier—a bass player and officer in the South Bay New Orleans Jazz Club—introduced her to yours truly and the JazzAmerica program. (JA, established in 1994, is a tuition-free program of traditional and big band jazz instruction that was co-founded by the legendary Buddy Collette.) Chloe distinguished herself on clarinet in our Gumbo Combo in the spring, and on tenor sax in the Big Band that summer. That fall, we recommended her to the LA Jazz Society, which conferred its New Talent Award to Chloe. Then it was time for college. Other musicians and bands continue to look to Chloe for her stellar musicianship and winning personality. One of them is Tom McDermott. “Originally from St. Louis, Tom has been in New Orleans for over 30 years and has become a staple in the scene. He is a master at piano and has a deep affinity for not only traditional jazz but all kinds of music, especially Brazlian choro. He has gone to Brazil many times over the years and has learned to make the chorus his own. I am honored that he enjoys playing with me and we have a CD coming out next year which I am very excited about. A look at the “Schedule” page of the ChloeFeoranzo.com website reveals a dizzying array of her gigs in October: Shotgun Jazz Band, Jenavieve Cook and the Royal Street Winding Boys, Riverside Jazz Collective, Tom McDermott Duo, Larry Scala Band, Michael Gamble and the Rhythm Serenaders, Antoine Diel and the Misfit Power, Chas Justus and the Jury—just to name a few. Clearly, Chloe Feoranzo has arrived; not just in New Orleans, but as a fixture in the traditional jazz scene, with an unending profusion of performances and recordings. Her sound is as compelling as her personality—sparkling yet tastefully understated, exuberant without ego. Fortunately, a hurricane is not the only thing to hit New Orleans by storm. Richard Simon taught English in the Los Angeles Community College District before taking up the bass at the age of 30. He studied with the legendary Red Callender, and began working with LA’s elder jazz elite, including Buddy Collette, Teddy Edwards, Lorez Alexandria, and Plas Johnson. He wrote of meeting and jamming with the late King Bhumibol of Thailand for our November issue. Visit him online at www.richardsimon.com; write him at ufobass@aol.com.